Launch of Il Tempo del Disgelo by Ilaria Locati. Readings by Ilaria Locati, Sara Elena Rossetti and Arturo Croci. Music by guitarist, Matteo Ugazio. Ilaria Locati Artist. She graduated from the Brera Academy in Milan with a degree in sculpture. She has participated in many one-person and group shows in Italy and Germany. Ilaria will read poems from her book, Il Tempo del Disgelo (The Thawing). Sara Elena Rossetti Poet and teacher. 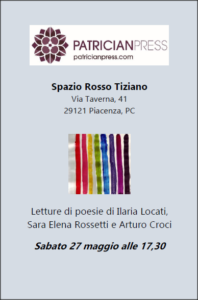 She will read poems from Arcobaleno-Rainbow, published by Patrician Press, and a piece from her translation of Christina Rossetti’s Goblin Market. Arturo Croci Journalist and writer. He has a diploma in horticulture from Minoprio, Como and studied philosophy at the University of Barcelona. He will read some new poems. Patricia Borlenghi Writer and publisher. She will read from Letters to the Cultural Rehabilitation of the Unemployed (English edition) by Andrea Inglese, together with Sara Rossetti, who translated Andrea’s book. Matteo Ugazio Musician. He studied at the Giuseppe Nicolini conservatoire in Piacenza and has attended various master-classes with internationally famous musicians. He is now studying jazz music with Carmelo Tartamella at the Milestone School of Music.